I first came across this photo (above) a couple years ago among the Shanower family material my cousin Burleigh J. "B.J." Shanower (1889-1985) donated to the Shanower library at the Pioneer Village in Burton, Geauga County, Ohio. Right away I recognized my great-great-grandfather Benjamin Franklin Shanower (1845-1928) standing at the center. I'd seen him only in one other photo without a beard (below left). In most photos he wears a beard. But there's no mistaking him in this photo. 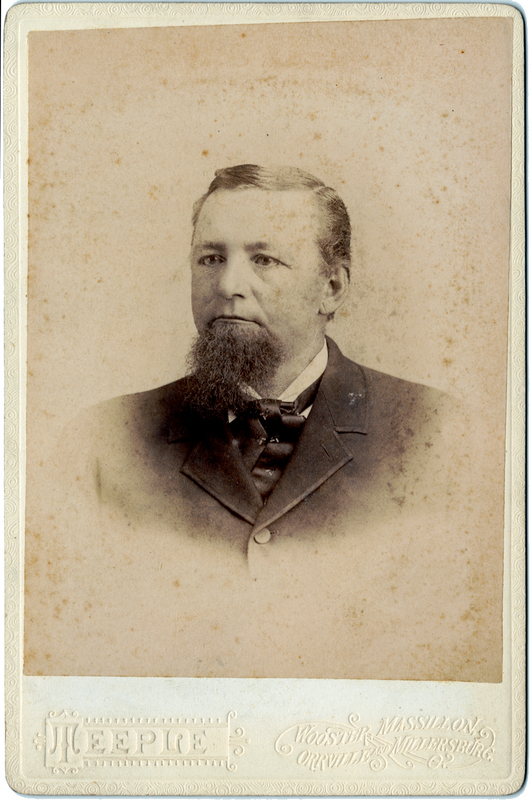 Benjamin Franklin Shanower, with beard, circa 1880. Benjamin Franklin Shanower, without beard, 1870. I was pretty sure the figure standing on the left is Ben's brother Nathaniel E. Shanower (1853-1936), the father of B.J. Shanower, whom this photo had once belonged to. 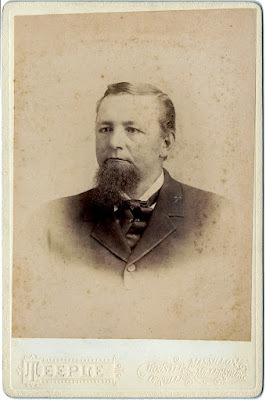 Nathaniel E. Shanower, circa 1900. But I wasn't sure who the other men could be. The photo has no identifications. Were the others friends? Brothers? Since Ben and Nathaniel were brothers, I thought it likely that the other men were, too. I approached my attempt to identify them with that assumption. But seven men appear in the photo, so they can't all be brothers. If five of them are brothers, then two of them are not. Who are those two? 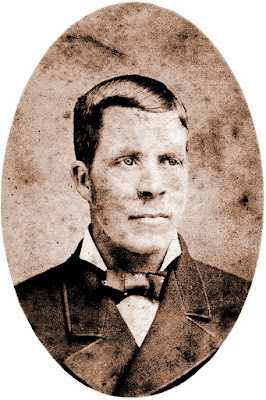 None of them can be their father John Abraham Shanower since he died in 1859 when Ben, the eldest brother, was fourteen years old. Ben is clearly older than fourteen here. That's quite a spread--twenty years--for the Shanower girls' wedding days. 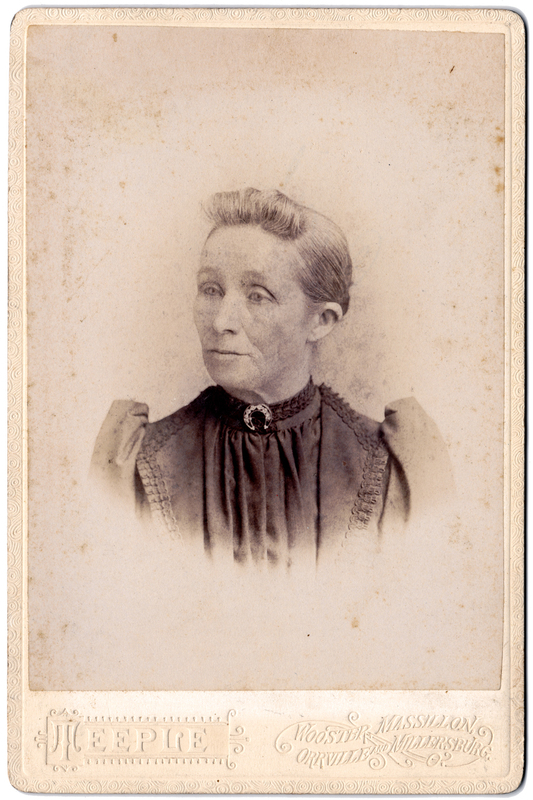 Mary Ann and Ellen were both married by early 1871. Clara, the next sister married, was wed in 1877. 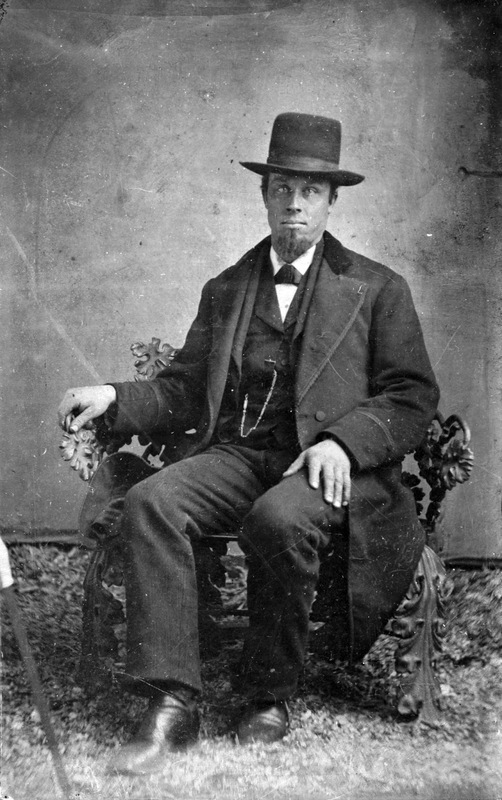 So if the two extra men are brothers-in-law, the photo was likely shot between January 1871 and December 1877. 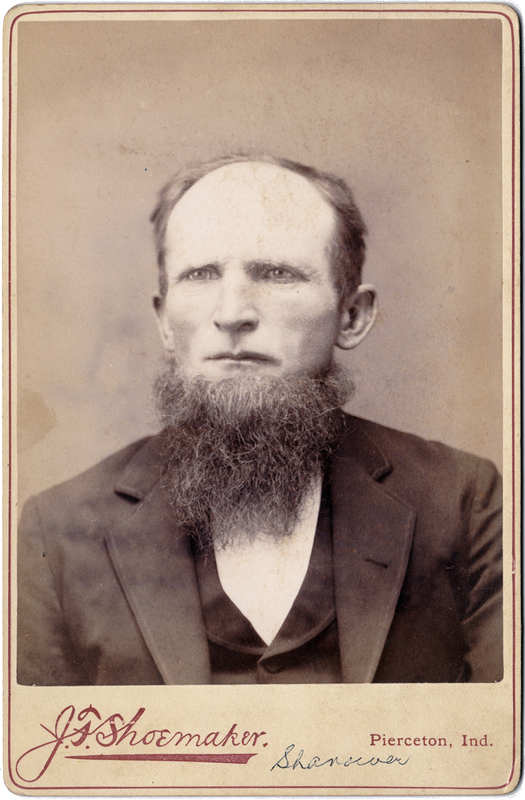 Ben's lack of a beard indicates a date in the early 1870s. My best guess is that the photo was taken about 1873, give or take a year or two. If the two extra men are the brothers-in-law of Ben, their names were Levi Cecil and John Smith. But which of the five unidentified figures might they be? The figure seated on the right doesn't resemble the others. I doubt he was a blood relation. Could he be Levi or John? I have an album of photos from the mid- to late nineteenth century. The album once belonged to my great-great-grandparents Benjamin Franklin Shanower and his second wife Lucy Leifer Shanower. Most of the photos are unidentified. I recognize Ben's brother Nathaniel and his family in one. I'm sure some of the photos show other siblings of Ben. Two of them--clearly a paired set, one a portrait of a man, the other a portrait of a woman--are marked "Cecil" in pencil on their backs. Could the man be Levi Cecil? Unfortunately he doesn't resemble anyone in the photo of Ben and six other men. But are these paired photos really of anyone named Cecil? There are notes on other photos from the mostly unidentified album that are incorrect identifications--one Leifer photo has the name "Shanower" written on it (below). So I strongly question the written "Cecil" identification. This photo from the mostly unidentified album has a note that reads "Shanower." But it's actually Frederick Leifer, Jr. 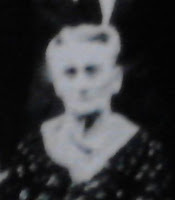 In the pair of photos marked "Cecil" (below) the woman seems rather elderly to be Mary Ann Shanower Cecil when the styles of her dress and of the photo are taken into account. She looks suspiciously like Ben's aunt, Rebecca Shanower Kroehle. (Compare her with the 1909 Shanower reunion photo here.) I believe this pair of photos actually depicts Rebecca Shanower Kroehle and her husband Philip Oscar Kroehle, and that whoever wrote "Cecil" on the photos was wrong. Noted as "Cecil," but it's Rebecca Shanower Kroehle. Noted as "Cecil," but I think it's Philip Kroehle. So I had no luck in securely identifying anyone in the original photo as Levi Cecil. Could I identify the other brother-in-law in 1873, John Smith? 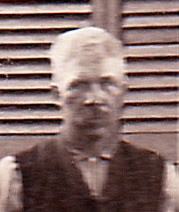 In the album of mostly unidentified photos, there's one (below) that shows a man that looks a lot like the standing figure on the right in the photo of Ben and six other men. 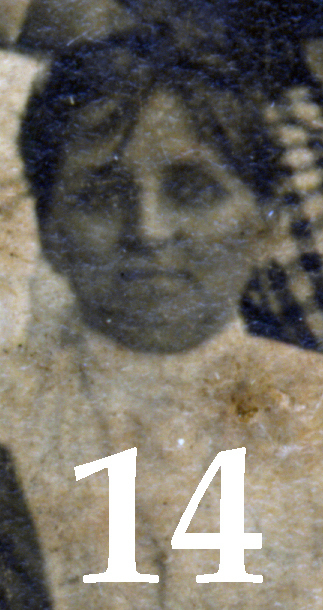 In the upper left corner of the album photo are some remnants of writing which could easily be reconstructed as "Smith." The writing seems to be an original identification, not a later guess, since the missing portions were cut off before the photo was mounted to its backing by the photography studio. 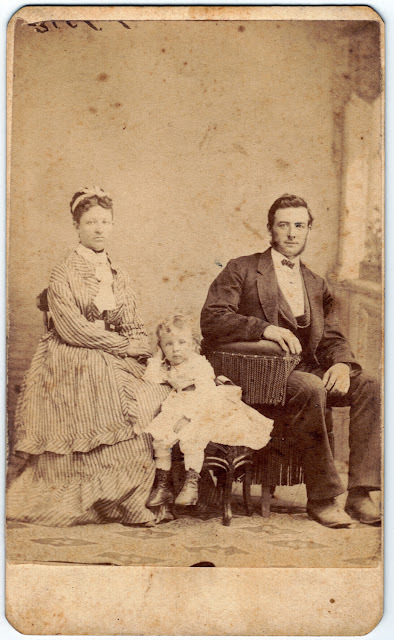 I believe the writing confirms that the album photo shows John Smith with his wife Ellen Shanower Smith and eldest child Minnie. And his resemblance in the two photos confirms that the photo of Ben and six other men shows John Smith standing on the right. 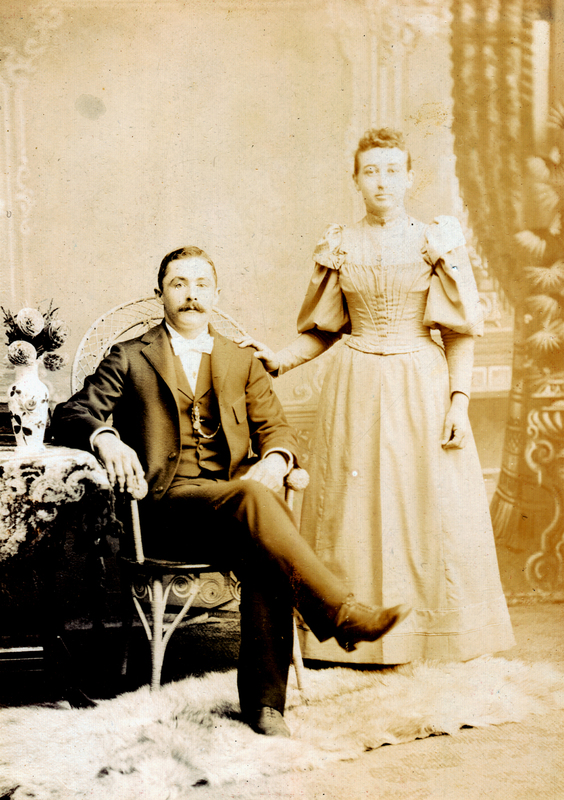 Ellen Shanower Smith, Clara Minerva "Minnie" Smith O'Donnel Engel Williams, and John E. Smith, circa 1874. Note the remnants of lettering in the upper left corner. Probably John E. Smith in 1909. There's a third photo that might show John Smith--the Shanower family reunion photo from 1909--which I wrote about in this previous post (detail on right). Figure 44 looks to me to be the same man as the two other photos. His presence at the Shanower reunion confirms him as a Shanower family member in some respect. I feel pretty secure in identifying him in all three photos as John E. Smith. If that's John Smith in the photo of Ben and six others, then I'm pretty sure that the photo shows the five Shanower brothers and their two brothers-in-law. I have no way to prove or disprove that the seated man on the right is brother-in-law Levi Cecil. It seems reasonable for the two brothers-in-law to be arranged in the photo on the right side together. So I'm going with the assumption that the seated right-hand figure is Levi Cecil. But which is which? Is there any clue in their arrangement in the photo? 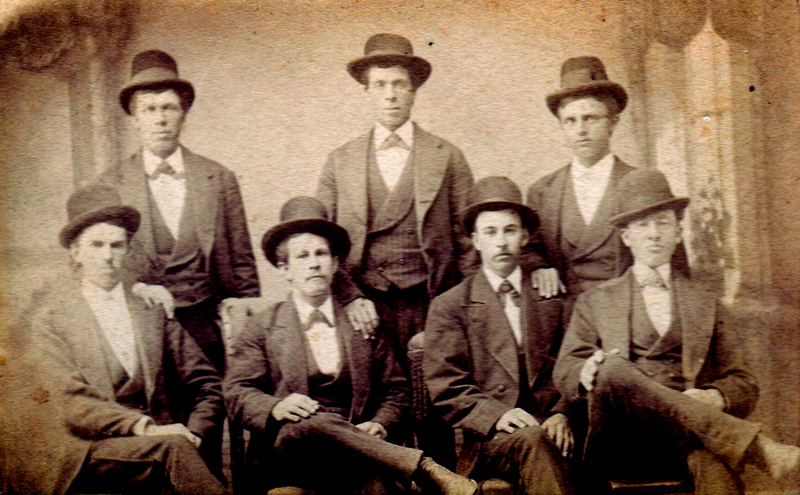 Ben, standing center, was the eldest brother. Nathaniel, standing on the left, beside Ben, was the fourth brother. So they don't seem to be arranged by age. I can't think of any other information communicated by their seating order. Can I find any of them in another photo? Figure 31 is Nathaniel E. Shanower in 1909. Who is figure 13? 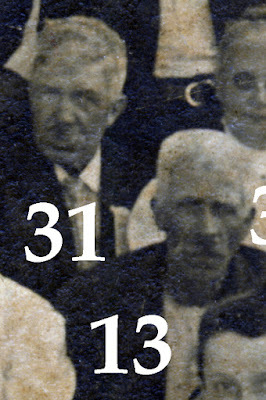 In the 1909 Shanower family reunion photo are two figures that I believe are Ben Shanower's brothers, figures 13 and 31. I believe figure 31 is Nathaniel Shanower, who's already identified in the photo of Ben and his brothers. Since brother William Shanower died in 1903, figure 13 has to be either Reuben or John, but I don't know which. I think figure 13 most closely resembles the figure seated second from left in the photo of Ben and six others. But I can't be sure. I have another photo (below) that I strongly suspect shows one of these Shanower brothers. The photo, from about 1920, shows Lloyd E. Shanower seated at the upper right and his two young sons, Delmer Lloyd Shanower Fentress standing on the bottom step and Wilbur J. "Mickey" Shanower Fentress sitting just below his father Lloyd. Lloyd Shanower (upper right) with young sons Delmer and Mickey, circa 1920. And who else? This photo shows two other people, a woman and a man, both elderly. When I first saw this photo, I thought they must be Reuben Shanower and his wife Lydia A. Karrer Shanower, Lloyd's parents and the grandparents of the two young boys. But Reuben Shanower died in 1912, so this photo can't include him. I assume by extension that the woman isn't Reuben's wife Lydia, though she was alive in 1920. Lydia Karrer Shanower's sister Elizabeth E. Karrer married John A. Shanower as his second wife. That made Elizabeth the great aunt of the two young boys, Del and Mickey, in two ways--both by marriage and by blood. John Shanower was the boys' great uncle and their father Lloyd's uncle. These relationships made it perfectly reasonable for these people to appear together in a photo. So I think the old couple in this 1920 photo is wife and husband Elizabeth E. Karrer Shanower and John A. Shanower. 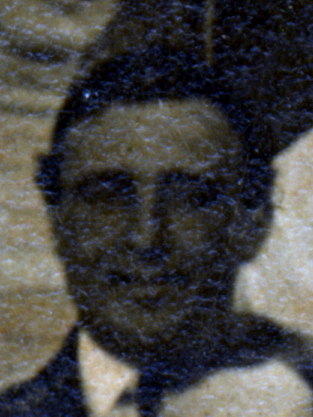 Figure 13 in the 1909 Shanower reunion photo is either Reuben or John Shanower. I think figure 13 is not the same as the old man in the 1920 photo of Lloyd Shanower and his two young sons. If my conclusion is correct, figure 13 is not John Shanower. That means figure 13 in the reunion photo is most likely Reuben Shanower and figure 14 is likely Lydia Karrer Shanower. I don't see much resemblance between figure 14 and the woman in the 1920 photo, who I think is Elizabeth Karrer Shanower. 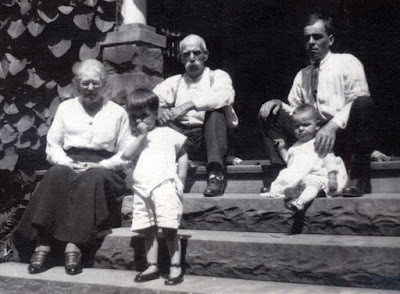 I believe the figure I've identified as John Shanower in the 1920 photo most closely resembles the figure seated on the left in the photo of Ben and his brothers. That leaves Reuben and William as the two remaining brothers. Can I identify one or the other, thus giving me the identities of both? I'm not sure. 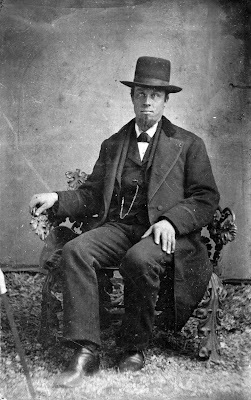 The album of unidentified photos contains a photo (below) with a man that resembles the figure seated second from left. Is this a Shanower brother and his wife? I have one photo identified as Lydia Karrer Shanower (right), but in it she's elderly and the photo's extremely blurry. I'm also not confident that she's Lydia. She might be Lydia's daughter-in-law, Ethel Sheehan Shanower Fentress. In any case, she doesn't look much like the woman in the unidentified album photo. Figure 14 in the 1909 Shanower family reunion photo might be Lydia Karrer Shanower, especially if figure 13 is Reuben Shanower. I think figure 14 looks a little like the woman in the unidentified album photo. I have several securely identified photos of Melissa A. Gerber Shanower (below). Melissa had a pretty strong jawline. If I had to guess, I'd say the woman in the unidentified album photo doesn't look much like Melissa. If that guess is correct, then chances are that the man in the album photo is Reuben Shanower. Three views of Melissa Gerber Shanower--circa 1887, circa 1900, and in 1909. And I think that man most closely resembles the figure seated second from left in the photo of Ben and brothers. That leaves the figure seated second from right as the only remaining brother, William. But I'm not sure. I keep changing my guesses.